Figure 1. SeaBeam bathymetric map of the southern Juan de Fuca Ridge (uncorrected for sound velocity), from Embley and others, 1991. Contour interval, 100 m. Temperature anomaly contours (°C) of megaplumes I (August 1986) and II (September 1987) are from Baker and others, 1989. Pillow mounds are shown in black, the zone of young sheet-flows is indicated by diagonal shading, and high-temperature vents are marked by stars. References. Baker, E.T., Lavelle, J.W., Feely, R.A., Massoth, G.J., and Walker, S.L., 1989, Episodic venting of hydrothermal fluids from the Juan de Fuca Ridge: JGR, v. 94, p. 9237-9250. Embley, R.W., Chadwick, W., Perfit, M.R., and Baker, E.T., 1991, Geology of the Northern Cleft Segment, Juan de Fuca Ridge: recent lava flows, sea-floor spreading, and the formation of megaplumes: Geology, v. 19, p. 771-775. The Global Volcanism Program has no Weekly Reports available for Cleft Segment. The Cleft Segment, the southernmost of the Juan de Fuca Ridge, lies immediately north of the Blanco Fracture Zone. The 80-km-long segment is named for a nearly continuous 10-km-long, 30-50 m wide cleft at its southern end. Two episodes of seafloor spreading were documented along the northern part of the segment in the 1980's. Bathymetric surveys indicated that a series of discontinuous pillow-lava mounds were extruded along a 17-km-long fissure between 1981 and 1987. The eruption possibly took place at the time of emission of a large plume of hot mineral-laden water in 1986. The location is at a depth of about 2300 m near the northern edge of the Cleft segment and the southern end of the Vance segment of the Juan de Fuca Ridge, about 500 km W of the central Oregon coast. Youthful sheet-lava flows immediately south of the pillow lavas were estimated to be only a few years older. Baker E T, 1991. Megaplumes. Oceanus, 34: 84-91. Chadwick W W Jr, Embley R W, Fox C G, 1991. Evidence for volcanic eruption on the southern Juan de Fuca ridge between 1981 and 1987. Nature, 350: 416-418. Embley R W, Chadwick W W Jr, Perfit M R, Baker E T, 1991. Geology of the northern Cleft Segment, Juan de Fuca Ridge: recent lava flows, sea-floor spreading, and the formation of megplumes. Geology, 19: 771-775. Koski R A, Jonasson I R, Kadko D C, Smith V K, Wong F L, 1994. Compositions, growth mechanisms, and temporal relations of hydrothermal sulfide-sulfate-silica chimneys at the northern Cleft Segment, Juan de Fuca Ridge. J. Geophys. Res, 99: 4813-4832. Perfit M R, Chadwick W W Jr, 1998. Magmatism at Mid-Ocean ridges: constraints from volcanological and geochemical investigations. In: Buck W R, Delaney P T, Karson J A, Lagabrielle Y (eds) Faulting and Magmatism at Mid-Ocean Ridges Amer Geophys Union Geophys Monograph 106: 59-115. Smith M C, Perfit M R, Jonasson I R, 1994. Petrology and geochemistry of basalts from the southern Juan de Fuca: controls on the spatial and temporal evolution of mid-ocean ridge basalt. J. Geophys. Res, 99: 4787-4812. There is no Deformation History data available for Cleft Segment. There is no Emissions History data available for Cleft Segment. 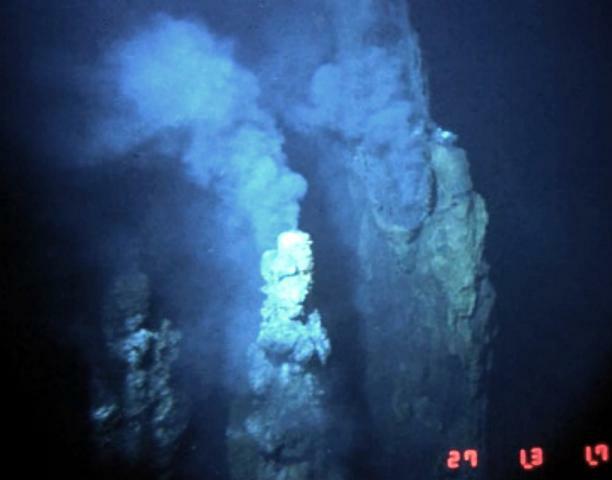 "Black Smoker" vents are active along the Cleft Segment, the southernmost of the Juan de Fuca Ridge. These sustained high-temperature vents were photographed along fissures that fed an older lava flow adjacent to a sea-floor lava flow that was emplaced in 1986 during the second of two documented submarine eruptions in the 1980s. The 80-km-long Cleft Segment is located immediately north of the Blanco Fracture Zone about 500 km off the Oregon coast. The Global Volcanism Program has no maps available for Cleft Segment. There are no samples for Cleft Segment in the Smithsonian's NMNH Department of Mineral Sciences Rock and Ore collection. IRIS seismic stations/networks Incorporated Research Institutions for Seismology (IRIS) Data Services map showing the location of seismic stations from all available networks (permanent or temporary) within a radius of 0.18° (about 20 km at mid-latitudes) from the given location of Cleft Segment. Users can customize a variety of filters and options in the left panel. Note that if there are no stations are known the map will default to show the entire world with a "No data matched request" error notice. Large Eruptions of Cleft Segment Information about large Quaternary eruptions (VEI >= 4) is cataloged in the Large Magnitude Explosive Volcanic Eruptions (LaMEVE) database of the Volcano Global Risk Identification and Analysis Project (VOGRIPA).